The generation 4 Corvette was produced for 13 years from 1984-1996. During this period a total of 358,180 C4 Corvettes were purchased. The C4 provided exceedingly advanced technology from computer controlled electronic engine management systems and highly developed engine components to very sophisticated stereo sound systems. The performance of the generation 4 Corvette was also impressive with top speeds ranging from 140 mph to 180 plus mph and quarter mile elapsed time performances reaching the 12 second range with the introduction of the ZR-1. The ZR-1 Corvette proved to be a superior super car thereby being referred to as the "King of the Hill". The ZR-1 package was the most sophisticated option for the C4 Corvette among the many exciting Corvette models that were created from 1984 to 1996. The 40th Anniversary Corvette was available in Corvette coupes and convertibles and featured a special ruby red color for the exterior and interior. Special chrome 40th anniversary badges were used to commemorate the 40th anniversary edition Corvette. The 1986 Corvette was the 2nd Corvette to provide pace car duties for the Indy 500 race. The car was painted bright yellow and featured special Indy Pace car lettering. The 1995 Corvette was the 3rd Corvette to pace the Indy 500 race and it sported a unique paint scheme with ZR-1 wheels and special two tone sport seats. The Grand Sport package was equipped with the LT-4 engine and 6 speed manual transmission. The unique paint scheme included admiral blue paint and a white stripe with red fender hash marks, which were located on the drivers side only. The ZR-1 style wheels were painted black and equipped with wider 315/35R17 rear tires. The 1996 Grand Sport also featured a unique rear body component with the use of special fender flares to cover the wider wheel and tire combination. The 1996 Collector Edition Corvette was created to commemorate the end of the 4th generation Corvette. This special option package included Sebring Silver paint, commemorative edition emblems and silver painted wheels. The C4 used 5 different V8 engines during these years and all were fuel injected with electronic engine management. The L83 engine is equipped with the first form of throttle body fuel injection for the Corvette, referred to as Cross Fire Fuel Injection by Chevrolet, which is also commonly known as Throttle Body Injection (TBI). The dual throttle bodies provided air flow to the intake ports in a cross end method, which is defined by the term Cross Fire Fuel Injection. The L98 Corvette engine was introduced in 1985 with tuned-port fuel injection, and also featured a mass airflow sensor, tuned intake runners, and an air cleaner mounted in front of the radiator support. The L98 engine was a technologically advanced fuel injected engine that delivered a 10% increase of power with fuel economy also improving by 10% over the previous L83 Corvette engine. 1985-86 engines produce 230 hp and 330 lb-ft torque. 1987-89 engines produce 240 hp and 335 lb-ft torque. 1990-91 engines produce 250 hp and 350 lb-ft torque. Corvette ZR-1 was introduced as a state-of-the-art high performance machine, equipped with leading-edge engine technology delivered by an all aluminum 5.7 Liter V8 that develops 375 horsepower. The ZR-1 has a distinctive appearance that results from the use of the widest tires ever put on a production sports car up to the year 1990. The 315/35ZR-17 tires were specifically developed by Goodyear for the ZR-1 Corvette and required a wider rear body design for the ZR-1 to accommodate these larger tires. The unique features that are distinctive to the ZR-1 Corvette are the roof mounted brake light and the rounded rear bumper. Only the ZR-1 has the older style roof mounted brake light and the newer rounded rear bumper design on all models. The 1990 -1992 LT5 engine power rating of 375 hp provided an increase of 125 hp from the base L98 Corvette engine rated at 250 hp. The 1993 -1995 LT5 engines have modified heads and intake manifolds to produce 405 hp, which is 105 hp more than the LT1 Corvette engine rated at 300 hp. LT5 engines have 32 valves, dual-overhead-cam and multi-port fuel injection. The LT5 is a Lotus-GM designed engine and built by Mercury Marine. 1990-1992 LT5 engines produce 375 hp and 370 lb-ft of torque. 1993-1995 LT5 engines produce 405 hp and 385 lb-ft of torque. The ZR1 is still the most expense Corvette production car ever produced by GM, with the price of a 1995 ZR1 being over $68,000 USD. Total production for the ZR1 Corvette is 6,939 cars. The Corvette engine got more technologically advanced with the introduction of the 2nd generation Corvette small block engine, named the LT1. The engine redline was 5,700 rpm, which is 700 rpm higher than the previous L-98 Corvette engine. The LT1 also had more compression, better flowing heads, more advanced computer technology, and reverse flow cooling system. 1992-1993 engines are rated at 300 hp and 330 lb-ft of torque. 1994-1996 engines are rated at 300 hp and 340 lb-ft torque. The 300 net horsepower rating for the new LT1 would be closer to 400 gross horsepower, when measured in 1970 standards for power ratings. This makes the new LT1 engine more powerful than the 1970 LT-1 Corvette engine. The new LT1 Corvette can produce 0-60 mph in 5.6 seconds and run the quarter mile in 13.7 seconds at 104 mph, which is faster than the 1970 LT-1 Corvette. In 1996, GM introduced the LT4 as the most powerful production small block V8 in the history of Corvette, with power output conservatively rated at 330 horsepower at 5800 rpm and 340 lb-ft at 4500 rpm. This 330 net horsepower rating for the LT4 engine has been reported to be conservative, as stock Grand Sport Corvettes with original equipment, have produced 300 to 310 RWHP on chassis dyno tests. This represents 350 to 360 net horsepower when factoring in a 15% drivetrain loss during rear wheel chassis dyno tests. The optional LT4 engine is an upgrade of the LT1 with higher 10.8:1 compression ratio, more aggressive camshaft profile, 1.6 ratio aluminium rocker arms, new and improved cylinder heads with larger diameter valves, and a red powder coated intake manifold. LT4 engines are installed in 7,359 of the 21,527 Corvettes produced in 1996. The LT4 is the last original design small block production engine for the Corvette. The LT4 is the standard engine for 1000 special edition Grand Sport Corvettes. 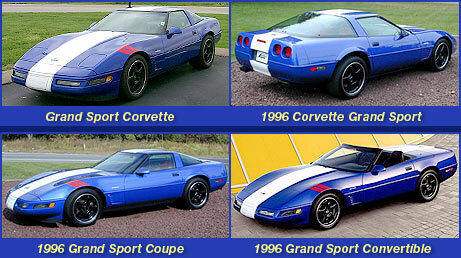 The 1996 Grand Sport Corvette is a tribute to the famous 1963 Corvette Grand Sport race cars. The original appearance of the 1963 Grand Sport is also evident in the 1996 Grand Sport, with Artic White striping on Admiral Blue paint. Grand Sport is the highest-performance regular-production Corvette offered by Chevrolet for 1996 and comes equipped with the required LT4 engine option and 6-speed manual transmission. A special Collector Edition Corvette was produced in 1996 to commemorate the end of the fourth-generation Corvette. The Collector Edition option package, available for Coupes and Convertibles, included special commemorative edition emblems and Sebring Silver paint that was also applied as a matching color for the wheels. The Collector Edition option was a popular package for the 1996 Corvette with 4,031 coupes and 1,381 convertibles being sold. The total production of 5,412 Collector Edition Corvettes represents more than 25% of the 21,527 Corvettes that were purchased. The LT4 engine option was also available for the Collector Edition Corvette providing more power and better performance. This is the last year for the Generation 4 Corvette. Rolling Thunderz designs and develops technologically advanced Corvette EFI engines that produce over 700 horsepower naturally aspirated with 93 octane pump gasoline. Dennis MacDonald’s 1986 Corvette which is piloted by his nephew Steve MacDonald is one of the World’s Fastest Street Legal Corvettes and a multiple race record holder in the American Supercar Challenge Corvette and Viper drag race series.